About the Hungarian Literature Mission: “JóHír” was founded in 1986 by Dr. Frank Sreter with a purpose to translate, print, and distribute—for very low cost or free of charge—evangelical tracts, leaflets, and books throughout the Hungarian-speaking countries of Eastern Europe. About our mission field: At first, 1986, hostility to the Gospel in these areas made it necessary for “JóHír” to operate in a clandestine manner. But after a few years, tremendous changes began to take place! So at that time, 1991, it pleased our Lord to open the doors fully. 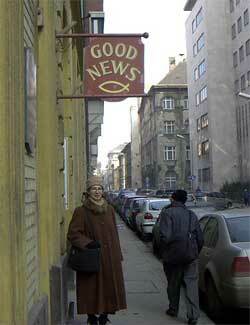 We now have the privilege introduce the Good News to Hungarian people all over Eastern Europe—in Hungary, Romania, and parts of the former Soviet Union. (Since approximately four to five million Hungarians are living outside of Hungary proper, much of our printed literature is distributed in these surrounding countries.) It is our desire to flood these countries with the Gospel and Gospel literature—so that if and when the area again becomes closed, a healthy supply of Gospel material will already be in place. The people who receive our literature are simply everyday people. They have a great hunger for books and material to read—we receive many letters from this part of the world each year asking for more and more of this literature. (And the need is imminent, as many cults are also distributing their literature!) But the economical situation of the Hungarian people, as you may be aware, is so depressed that most simply cannot afford to pay for books and tracts. So we distribute much of our material free, (or nearly free), of charge, with the help of missionaries and local churches. Some of our expert translators are often willing to do the translation work on a volunteer basis, as unto the Lord. Paul is very active in evangelism having opportunity to go into the public schools, many diverse churches, prisons, and on the streets of Budapest sharing the gospel of the Lord Jesus Christ and distributing tracts and other literature. A video has been recorded, by the prison authorities, of Paul's Gospel Illusion Program. This video is shown in the prisons and goes directly into the cells where prisoners are confined. The ,,JóHír” literature ministry and the evangelism program work hand and hand as much gospel literature is distributed to the peoples of Hungary. “JóHír” web sites: www.johir.com (English) www.johir.org (Hungarian Language). About our founder: Dr. Frank Sreter, M.D., Ph.D., (Retired), is the founder of ,,JóHír” (Good News) Hungarian Literature Mission. He is retired from Harvard University where he was employed as a medical research doctor. Frank escaped from Hungary during the 1956 revolution with his wife and two young children, when the country was still under communist rule. He immigrated to Canada and eventually settled in the United States. Frank worked in a secular job for most of his life fellowshipping at local Assemblies, including his current place of fellowship[ @ Valley Bible Fellowship, Georgetown, Massachusetts. Near the age of 64, he developed a strong desire to serve the Lord and the people of Hungary. He became a missionary to Hungary, commended by Countryside Bible Chapel, Lexington, Massachusetts, and in 1986 he created the organization now known as ,,JóHír” (Good News) Hungarian Literature Mission. Frank and Paul are in the "Christian Missions in Many Lands" prayer hand book. 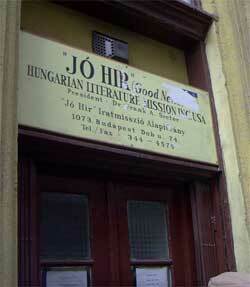 About our literature: The following are links to some of the outreach programs of “JóHír”. Evangelism: Gospel Illusions, Object Lessons, and skits!